Although artist Piper Shepard does not pick up sticks and string, she has something in common with any lace knitter. She creates lace that isn't "official." This summer, Shepard's two installations -- together called Filigree Spaces -- grace the halls of the Baltimore Museum of Art (BMA). 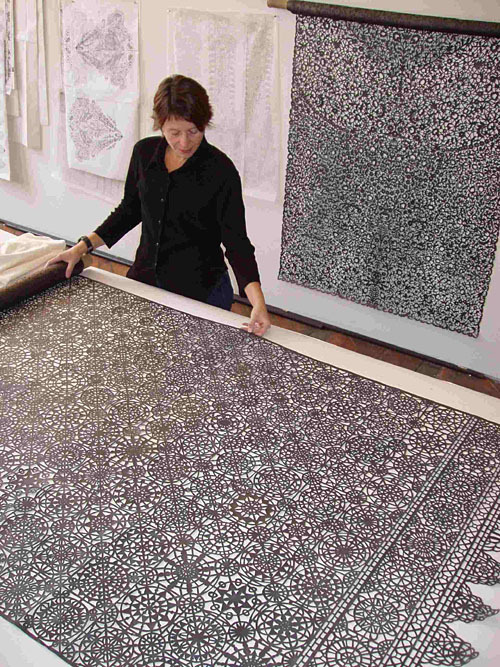 To create each work, the artist coated huge muslin panels with graphite, then hand cut an exquisite, intricate lace design into each piece -- making enough fabric to completely drape the floor-to-ceiling windows in the museum's lobby and create five fabric rooms. The mind boggles at the sheer size of the work -- Shepard's largest to date -- the focus and patience required, and the delicacy of the fine-boned patterns. Shepard's panels cast elaborate shadows. They're handmade. They're fabric. They're full of delicious holes. But they're not lace. There are two official kinds of lace, explains BMA's Curator of Decorative Arts for Textiles, Anita Jones. Most textile pros classify lace first by technique, then by geography and design. The only two traditional kinds are bobbin lace and needle lace. Bobbin lace involves a sort of weaving process, with the lace maker crossing several strands of fiber in complex patterns over a special pillow. 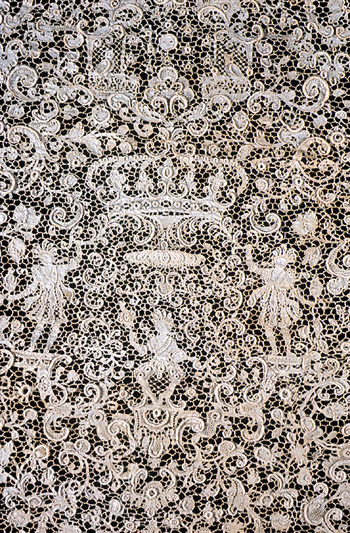 Once complete, the lace is removed from the pillow and exists on its own. Needle lace involves sewing a series of buttonhole loops into a backing, the loops varying in their placement and complexity, but all connecting to one another and creating a stand-alone fabric once the backing is removed. Jones's own definition, created on the fly, is freeing and thought provoking. "Lace is a fabric that has open areas," says Jones. "What is not there is as important as what's there." Shepard says, "I like Anita's definition. It's broad and therefore could encompass other traditional processes. 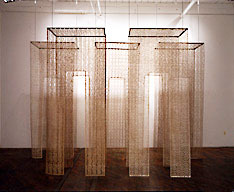 If I consider it then crochet, knitting, tatting, possibly some weaving, and my work can be interpreted as lace." Jones herself notes that many other techniques -- Irish crochet, tatting, knitting -- can result in a fabric that has lace tendencies. She has not been part of the sometimes passionate debate over whether knitting results in true lace. Her broad definition seems to leave room for the leaves/waves wraps and branching out scarves of our craft. "Anyone looking at it would consider it lace," Jones says. But as a curator she seems compelled to add, "...though it's not officially." Piper Shepard created her stunning installations in response to some gorgeous "official" lace -- historic pieces found in the museum's impressive Cone Collection. Detail, Flounce. Point de France needle lace. 17th century. France. Linen. The Baltimore Museum of Art: The Cone Collection. Two Baltimore sisters, Claribel and Etta Cone, were art collectors known for their holdings of Matisses and Picassos. But virtually unknown to the public, and even to textiles historians, was their impressive collection of more than 400 laces, purchased between visits to galleries and artist studios in Florence and Paris. Their collection -- bequeathed to the BMA in the 1950s -- ranges from very early pre-lace, such as 16th century embroideries, to early 20th century needle laces. Most are costume pieces that would make modern-day crafters salivate, including collars, cuffs, fan leaves, and flounces -- wide borders worn at the hems of skirts or priests' albs. All these laces were gifted to the museum wrapped in blue tissue paper, or mounted on red silk and folded into fabric envelopes that bore Claribel Cone's monogram. They were kept in a wooden chest with many drawers. Talk about a rare treat! When curator Jones first began working at the BMA in 1985, it was her job to open those drawers, reach into the delicate envelopes and tissue-wrapped packages, and study, research, identify, catalogue, and re-house the Cone laces. She engaged a volunteer lace maker to help her focus on each piece. "To measure it, photograph it, write down what we thought it was as opposed to what someone else thought it was before. It's difficult to be absolute about things, because lace makers could travel and pick up techniques. You have to be somewhat open-minded. Very knowledgeable people will make different judgments about a piece." 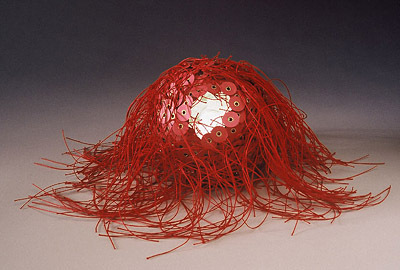 Once the whole collection was studied and re-housed, Jones was ready to create the first full exhibit of Cone laces, currently on display at the BMA. And she was ready to engage Shepard in commenting on the Cone Collection with her contemporary installations. Delving into the collection "was amazing, a bit intimidating, and rather humbling," says Shepherd. "The quality of handwork, the intimacy of scale and intensity of the structure was incredible. Just thinking about an individual or individuals making a textile so intricately and with such labor intensity was a quality I wanted to focus upon." Shepard selected four pieces of the Cone Collection for her inspiration: a 19th-century Rosaline bobbin lace shawl from Belgium, a 16th-century Italian cutwork Reticella handkerchief, a 19th-century Belgian Point de Gaze needle lace, and a black Chantilly parasol from the 1800s. She did much of the cutting herself, a tremendous task, but brought in one other artist and one or two helpers to complete the installation on deadline. The two exhibits, contemporary art and historical lace, now stand side by side at the BMA through fall 2005 -- a binary star of intricacy, intention, and labor. Piper Shepard with a panel from Along Lace Lines. Perhaps what is most striking is the similarity between what a knitter does, what Shepard does, and even what Jones does. Every one of us is engaged in an intimate, laborious hand-work process, in which we must focus one stitch, one cut, one acid-free tissue package at a time. And then we must repeat, repeat, repeat. "Attention to detail" merely scratches the surface of describing jobs -- knitter, artist, curator -- that border on self-treatment for OCD. In a world where the last repeats of a shawl can seem demoralizing, hand cutting thousands of square feet of intricate lace must have been a crushing task. "The space was so inspiring and overwhelming that I knew I had to work consistently," Shepard says of the drive to finish. "Having an exhibition at a major museum in my home town also helps keep the motivation going. I knew when I saw the space at The Baltimore Museum of Art, that it was a very special opportunity." Though Shepard has the walls of the BMA, and we knitters have our state fairs, curators' work is rarely enjoyed by the public. Jones says, "When you open up box after box after box and you have to laboriously fold things, write them down, enter them in a computer, you think why can't I show people this? They don't realize what it takes. The meticulous work to save things." For all of us the tedious process is crucial and so ultimately, soothingly, maddeningly enjoyable. The results are stunning -- be they tiny packets trimmed with hand-written tags, sumptuous shawls made of Kidsilk Haze, or room-size installations that cast shadows on the floor and create environments of hole-y fabric for us to move through. Whether any of these results are considered lace turns out to be up to us. To read more about Piper Shepard's installation and the Cone Collection Legacy of Lace exhibit, go here. Larissa Brown is an artist from Portland, Oregon, who likes laborious work like knitting--or gluing hundreds of envelope clasps to a self-portrait scultpure. You can see more of her work at larissabrown.net or enjoy her knitting and her beautiful new son at her blog.